Have you always dreamed of truly flying like a bird? Then wingsuiting may be for you! Do you have at least 200 skydives under your belt (in the past 18 months)? If yes, then we can teach you! WNY’s Wingsuit School will help you select one of our introductory suits to use and give you the necessary ground training – including safety procedures, gear requirements, flight path, and numerous other considerations that come into play when you start flying a wingsuit. Here’s a bit more info about How to Learn to Fly a Wingsuit. Wingsuits (also referred to as “flying squirrel suits” or “birdman suits”) are jumpsuits that incorporate fabric between the arms and legs, allowing you to glide through the sky or along the earth. Proximity flying is a particular discipline that combines wingsuit flying and BASE jumping where you fly close to the object you jumped from or close to the ground. A wingsuit flight ends when the jumper opens their parachute and lands. There has only been one successful instance of a wingsuit being landed without a parachute by stuntman Gary Connery in 2012. 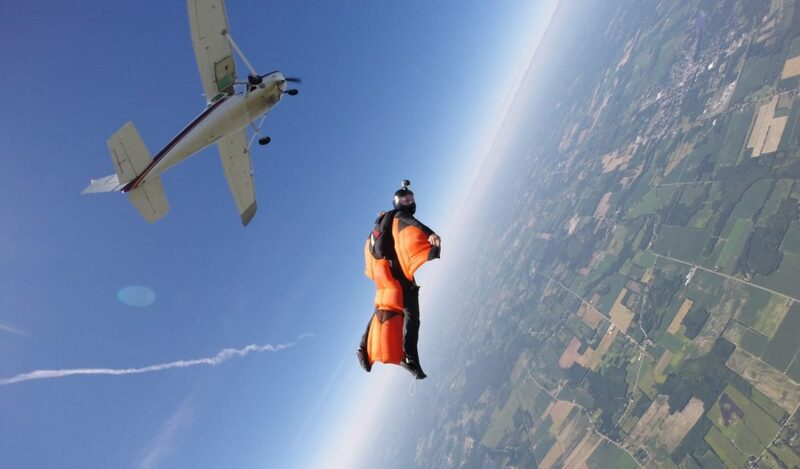 Our instructors will give classes almost every weekend at WNY Skydiving at the Pine Hill airport, but they are also willing to travel to other dropzones and teach first flight classes at your facility if there are enough interested students. We can help you make the right selection when you’re ready to buy a wingsuit and we have Tony Suit dealers on staff. We also buy and sell used wingsuits. Flying a wingsuit is an exhilarating experience but it requires the right level of experience, the proper equipment and quality training. Are you READY for the adventure of flight? Join the WNY Wingsuit School!